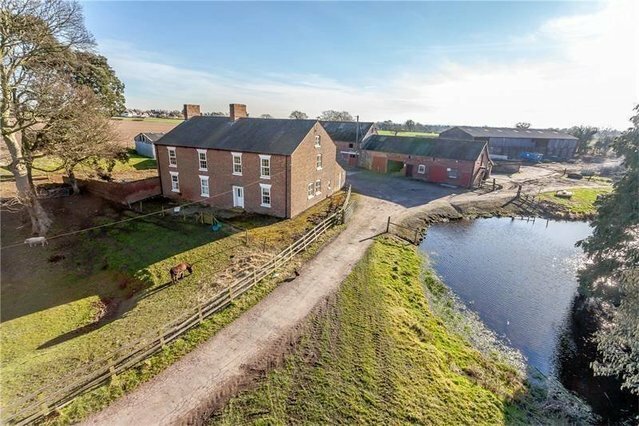 Substantial period farmhouse in a rural location including traditional farm buildings with planning consent for conversion to four residential units, range of modern farm buildings and 10 acres of land. This character period property currently offers generous accommodation arranged over two floors. It would benefit from a scheme of renovation and improvement. The property currently comprises boiler room, downstairs WC, utility room, kitchen, four reception rooms and hallway with stairs to first floor. The first floor provides seven bedrooms and family bathroom. There is substantial attic space on the second floor offering potential for conversion into living space. The farmhouse has planning consent (planning reference 18/01894/FUL) to divide it into two separate dwellings each providing three bedrooms and attractive modern family living areas. The planning consent includes permission to erect a garage block providing parking for six vehicles with a total floor area of 110.50 sq.m (1,189.41 sq. ft). Method of Sale: The property is offered for sale by private treaty. Tenure: The property is offered for sale freehold with vacant possession on completion. Boundary Responsibilities: The boundary responsibilities are shown with inward facing T marks on the plan. The purchaser will be responsible for erecting a stock proof fence between points A-B-C-D and E-F.
Services: Marton Hall Farm benefits from mains water, electricity and private sewerage. Where any of these services serves property not included in this sale, the buyer will be required to sever the supply at their own cost and make a new supply. Local Authority: Cheshire West & Chester Council. Wayleaves, Easements and Rights of Way: The sale is subject to all existing easements, wayleaves, public and private rights of way whether specified in these particulars or not. Vendors Costs: The purchasers will be required to pay 1.5% of the agreed purchase price in addition as a contribution towards the vendors legal and surveyors costs. Sales Particulars and Plans: The plans and schedule of land is based on the Ordnance Survey. These particulars and plans are believed to be correct but neither the vendor nor the agents shall be held liable for any error, misstatement, fault or defect in the particulars and plans, neither shall such error, misstatement, fault or defect annul the sale. Reservation and Future Development Rights: The property is sold subject to a reservation of future development rights whereby the vendor reserves the right to 50% of any increased value for a period of 80 years in the event that planning consent is obtained for residential development over and above the present residential dwelling and planning consent. Payment is due when either the planning consent is implemented or the site is sold with the benefit of planning consent. Town & Country Planning Act: The property, notwithstanding any description within these particulars of sale, is sold subject to any Development Plan, Tree Preservation Order, Town Planning Scheme or Agreement, Resolution of Notice which may or may not come to force and also subject to any statutory or by-law without obligation on the part of the vendor to specify them. Basic Payment Schemes and Agri-Environment Schemes: No Basic Payment Scheme entitlements are included in the sale. Planning: Prospective purchasers are advised that they should make their own enquiries of Cheshire West & Chester Council. Viewing: Strictly by appointment through Strutt & Parker on 01244 354888. The property is set within 10 acres of land and includes a range of modern agricultural buildings and concrete yard area. The property is approached from Whitegate Road/Delfords Lane via a private track which passes under the Whitegate Way cycle route. The land is divided by the Whitegate Way with an approximately 2.8 acres paddock lying to the north of the Whitegate Way and the remainder of the land lying to the south surrounding the farmhouse and buildings. To the north-west of the farmhouse and buildings is a Scheduled Monument known as Marton Grange. This is included within the sale area. The Historic England record details this as being a moated monastic grange, three fish ponds, connecting channels and base of a stone cross.